Here is a picture of Daddy and MJ hanging out together. 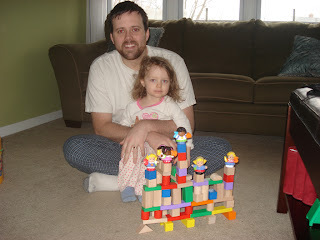 They both are creative and LOVE to build all sorts of towers together. This was my favorite tower that I have watched them build, so we had to take a picture. MJ added her favorite Little People on top of the tower. Before building time, MJ helped Mommy make some yummy homemade pancakes for us to enjoy. What a wonderful start to our day.